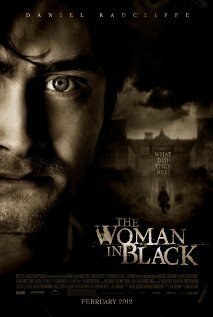 The Woman in Black Directed by James Watkins and starring Daniel Radcliffe is a story about a young lawyer who is plagued with the grief of his wife’s death. Now a single father Arthur Kipp must do everything he can to keep from falling apart. He is sent on a job to a small village to retrieve paper work for a house that must be put back on the market. Little does he know that this job would open him up to a world of paranormal activity and capture him upon the border between life and death. This Spiritual Horror is based on the novel written by Susan Hill. Set in the late 1800’s in a dreary England, the slow-moving beginning opens with the scene of three young girls playing happily. Their happiness soon turns into despair when they suddenly stop playing and make their way over to the window to jump out. Obviously not in their right minds, This scene does not do too much for movie goers but we were all eager to take the theatrical journey. After the suicide the movie proceeds to introduce the main character and his purpose. On the verge of loosing his job, Arthur arrives at the remote village to begin his work. He finds that the towns folk are very distant and unwelcoming. There is something terribly wrong with the atmosphere of this town, and there is no doubt that Arthur feels the tension that the town is giving off. He eventually settles in and makes his way over the house. Transported by horse and carriage he arrives at the eerie mansion. All alone he is left with his thoughts and the work he must do. Once he settled in he, familiarized himself with the property and automatically is distracted by suspicious sounds and the visions of ghostly apparitions. The subtlety of the activity up to this point is not impressive to me. Creepy bumps, and other noises just makes Arthur feel like he must investigate the house and property. What is interesting about this part is that Arthur learns some valid information about the owner of the house and her family history. Fortunately by the time things slightly intensify he is picked up and must return to the village for the night. At this point in the movie things really start to pick up as the director fully takes you into the story deeper. A child ends up dead and Arthur’s presence sets off a chain of events that makes the towns folk more fearful than ever. The ghostly superstitions that the town holds slowly surfaces and turns real the longer Arthur works in the house and stays in the village. Determined to get his work done to provide for his four-year son he decides to spend the night in the house to get more accomplished. This night is the most chilling and is the turning point where the director and writers as a whole step it up in their cinematic delivery. The woman in black makes her presence fully known as this thriller now officially turns into a horror. Things go pump in the night and the haunting of this woman deeply intensifies. Screams heard near and far, the movie is filled with suspense and action and keep you interested. I do not want to provide any more spoilers but The Woman in Black for me was a fresh take on an old recurring theme. It was not the traditional hunted house movie, despite some of the traditional elements, such as the screams, or the anticipation building music, and the parts where you think something is about to jump out but it is something totally non threatening. Daniel Radcliffe preformed very well considering this is his first on-screen movie role since Deathly Hallows part II. It was hard to not see Daniel as Harry. I felt like his glasses and wand were missing in some parts, but I feel that taking on new and exciting adult roles will be great for his career. Over all I think that the movie was quite thrilling and the director and crew did a wonderful job with creating and drawing you into the authentic element of the original novelist’s vision. I give this movie a B+ rating. I cant wait to see what Radcliffe has planned for his next project.